The recent bout of freezing weather shows that dangerous road conditions can occur even when you think spring has sprung and the worst of winter is over. Driving carefully at such times is crucial if you’re to avoid damaging your vehicle and, even worse, injuring yourself and other people. Allow time to de-ice windows – Many people set off in a hurry with windows still iced up, which is clearly very dangerous. Screenwash anti-freeze – It’s vital to top up your screenwash with a product that prevents the water from freezing. Turn off auto-wiper – Make sure ‘auto-wiper’ is switched off before starting up as frozen wipers could blow the wiper fuse. 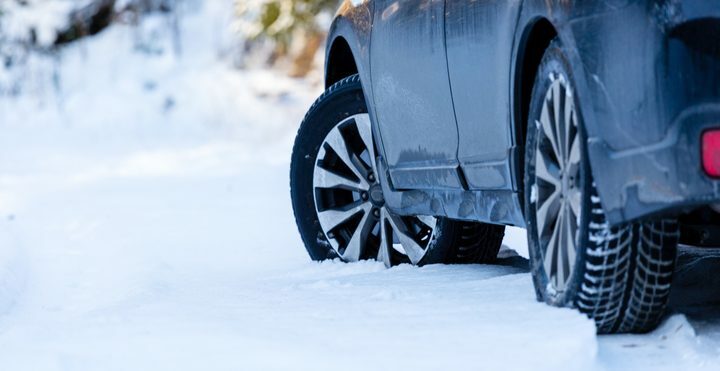 Check your tyres – Even high quality, new tyres have problems gripping in snow and ice. Make sure yours are in good shape whatever their age. Pack for being stuck – Make sure you pack at least some of the following: A torch, warm clothing, de-icer, blankets, a shovel, hi-vis vest, first-aid kit, warning triangle, water, food, jump leads and demisting pad. Footwear – Make sure your footwear is suitable for optimum driving (e.g. no huge boots or high heels!). Acceleration – Accelerate slowly and gently to help prevent wheel spin. Leave room – Give the car in front plenty of room in case they stop suddenly or slide backwards; up to 10 times the normal distance is recommended by the RAC. Use your gears – Keep in a low gear when going downhill and try to avoid breaking. Skidding – If you start to skid, steer into it gently and don’t jam on the brakes. Bends – Brake well before the bend and before you start to turn the steering wheel. Take your foot off the accelerator. Headlights – Keep them dipped in heavy snow and fog to avoid blinding oncoming drivers. Use all your lights to ensure the rear of your vehicle is lit up. Wheel tracks – On roads that haven’t been gritted, try and avoid other vehicles’ tracks as these offer less grip than fresh snow. Sun glare – Sunglasses can help reduce glare from a winter sun, so keep a pair handy. ‘Hidden’ ice – Even if a road seems clear of ice, it might not be in parts where snow and ice has less chance of melting, such as under bridges and next to high hedges. Speed – It goes without saying, but keep your speed well down and try and drive as smoothly as possible. Distractions – It’s a good idea to avoid distractions, such as the use of in-car phones and entertainment systems. Check your car over – Checking it over before you set off the next day could save you time and make you aware of anything you need to do, such as topping up tyre pressure or water. Clean off salt grit – Gritted roads leave residue on cars which can degrade the metal and cause rust to set in relatively quickly, so try and clean your car after each journey.